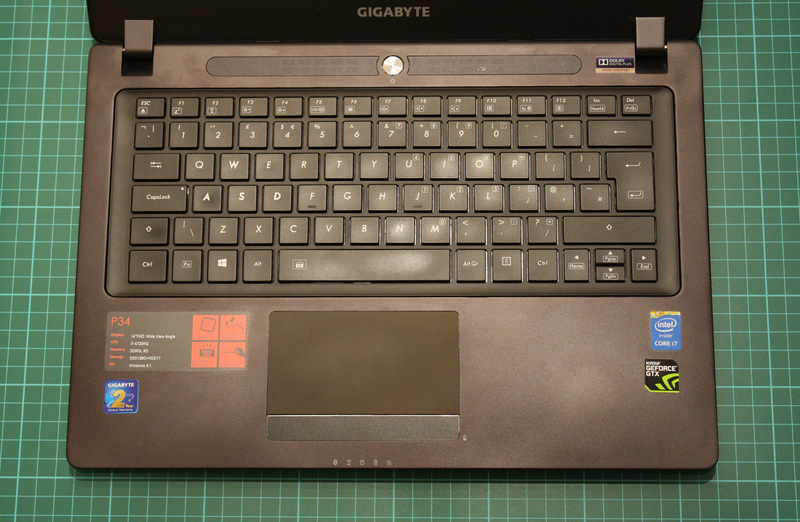 Today we’re looking at the P34W v3, the latest compact gaming laptop from Taiwanese manufacturers Gigabyte. The P34W v3 is powered by some of the latest and greatest components, including a fourth-generation Intel Core i7 processor and a Nvidia GTX 970 graphics card. Somehow, this is packed into a 1.8 kilogram design that measures just 21.9 millimetres thick. That should allow for impressive gaming performance in a tiny package, but how is it balanced by design, cooling and battery life? Let’s take a look. 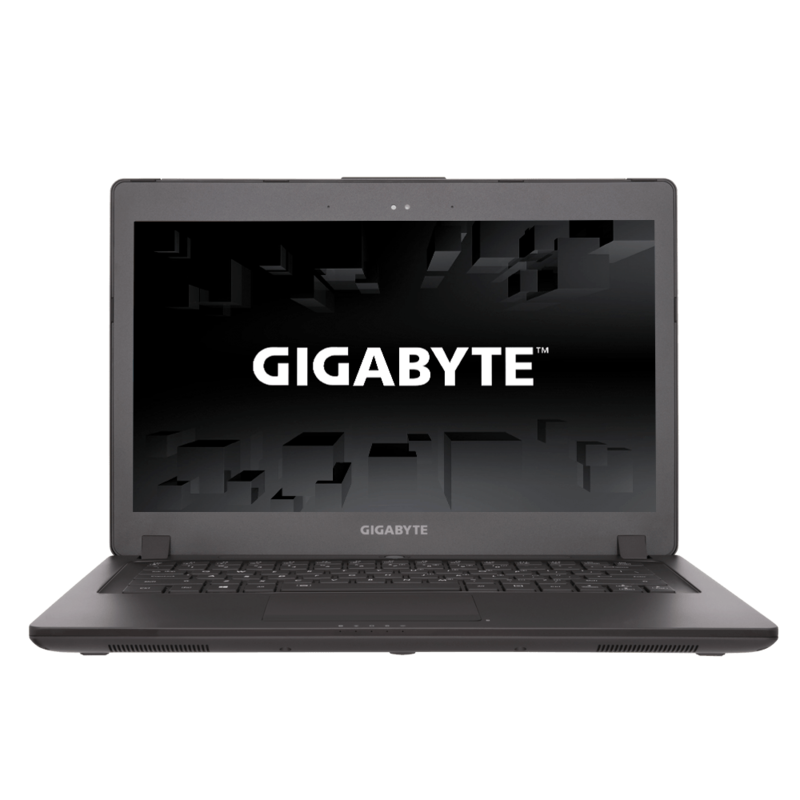 The Gigabyte P34W is a sensibly constructed laptop, with understated visuals but an attractively slim design with rounded corners throughout. Closed, it’ll fit inside even the smallest messenger bags with ease, not taking up much more space than the average full-size tablet. Its dark grey matte chassis lacks ornamentation; there are no brash LEDs like you’ll find on the average Alienware laptop. The lack of flair makes it look fairly anonymous, with little to catch the eye on first glance. Open up the laptop, and you’ll see the standard arrangement: 14-inch 1080p display flanked by a host of stickers and the manufacturer’s logo, with a webcam and proximity sensor tucked above. 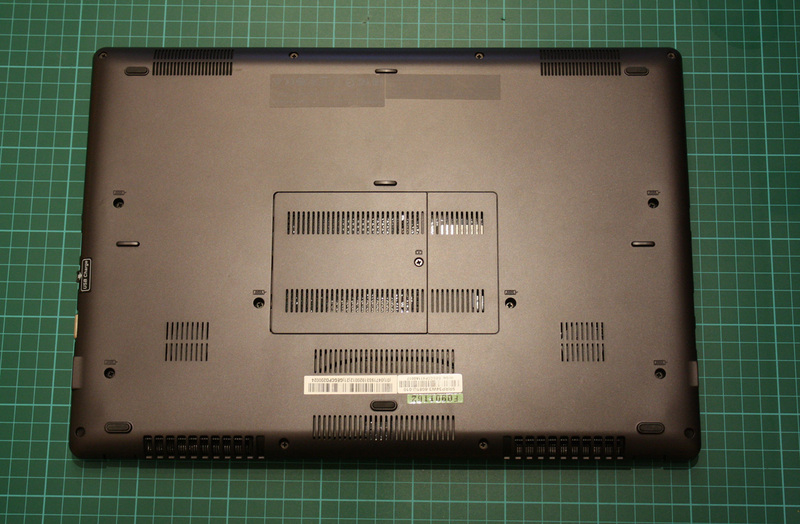 A pair of solid-feeling hinges connect the display to the main chassis, next to the laptop’s small stereo speakers and the brushed metal power button. There’s little to complain about with the keyboard, with a standard layout that uses a Function layer to include media controls, navigation keys and a numberpad. Key travel is limited, but full-size keys and handy white backlighting make this a reasonable choice for extended typing or gaming sessions. The outlined WASD keys in previous Gigabyte laptops have been replaced by more subtle bolded legends, which is an improvement in my eyes. 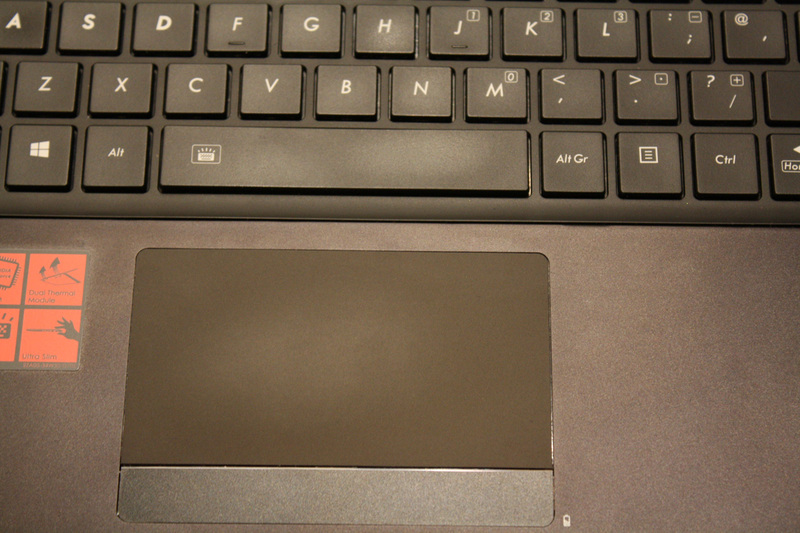 The trackpad is wide if not exceptionally tall, with the two buttons implemented as a single bar along the bottom. The standard edge and multiple finger gestures are present and correct too, making it quite straightforward to navigate through the Windows 8.1 OS. The P34W is replete with ports on its left and right sides. On the left we have a Kensington lock, an ethernet port, a VGA port, two USB 3.0 ports and a 3.5mm combined headphone / microphone port. On the right, we’ve got the power input, HDMI, an SD card slot and two further USB 3.0 ports. It’s a very good selection for a laptop of this size, and befits its status as a gaming machine. The bottom is, of course, replete with grilles, stickers and other laptop-y things. There’s a panel to let you access the machine’s RAM. 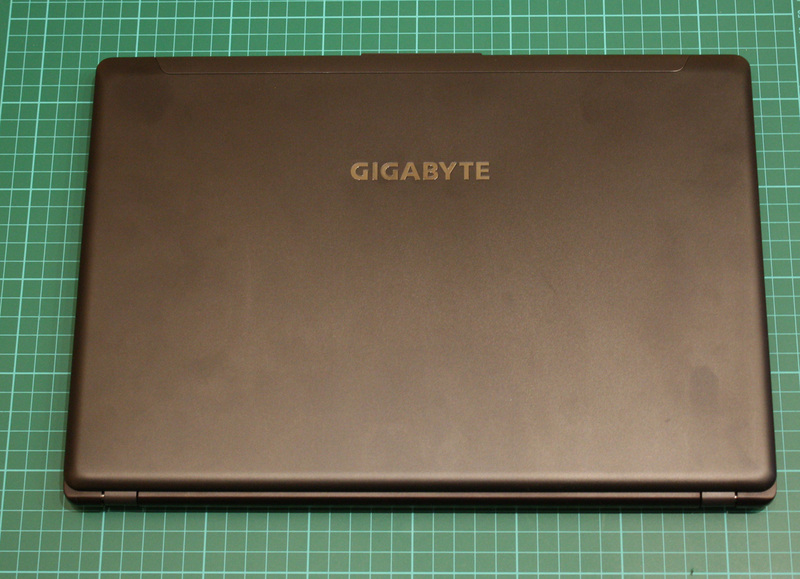 In order to give the Gigabyte P34W v3 a fair shout, we used it over a period of three weeks. During that time, we played games like Heroes of the Storm, Battlefield: Hardline, Counter-Strike: Global Offensive and Civilization V. We also did some work, which involved a lot of writing (including this review), light Photoshop loads and (probably too much) time surfing Reddit for cat pictures. Finally, we concluded our testing with a round of benchmarks, in order to get a quantitative measure of the laptop’s performance. The 1080p resolution is a wise choice for gaming, as it ensures that the latest titles can run at the screen’s native resolution. The Nvidia GTX 970 GPU also lets less graphically intense titles be rendered at 4K, then downscaled to 1080p to produce a better-looking result than rendering at 1080p would. The only noticeable disadvantage to gaming on the P34W v3 is the amount of noise that is produced by the system’s fans. While the ‘supra-cool’ cooling system does well to keep the laptop cool and performance up, it also produces a heck of a lot of noise. You may consider using headphones for intense workloads, and think twice about gaming in a quiet area like a library. The P34W is a strong candidate for getting work done. The backlit keyboard is a little shallow, but remains pretty easy to use. Combined with the solid trackpad, there’s little to slow you down here. As you’d expect from a gaming PC, performance is excellent. Whether you’re rendering an animation, performing complicated operations in Photoshop or compiling a program, you’ll certainly benefit from the gaming-grade components within. The hard drive arrangement here works well, with a solid-state drive for rapid access to your critical programs, and a mechanical drive for media storage. The display is also up to par, with good viewing angles and decent colour reproduction. The 1080p resolution works well in Windows 8.1, as it can be used at 100% scaling and therefore avoids some of the issues associated with more dense displays. The Gigabyte P34W v3 proves its gaming acumen immediately, with its current-gen GTX 970 processor providing some of the highest scores we’ve ever seen from a laptop in 3DMark. 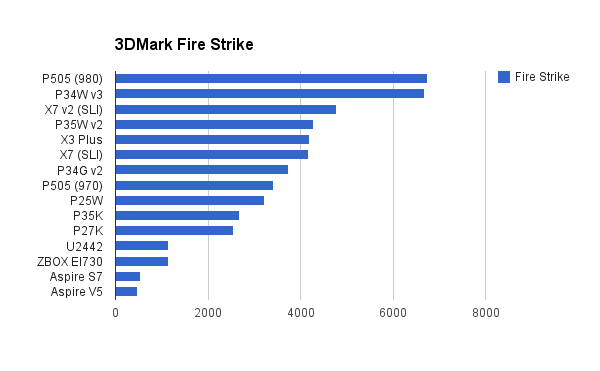 The P505’s GTX 980 proves its only better in the most challenging Fire Strike test, and the P34W v3 even scores more highly in the second-hardest Sky Diver test. Clearly the dual-pipe cooling solution is working well here, keeping temperatures down and performance up. 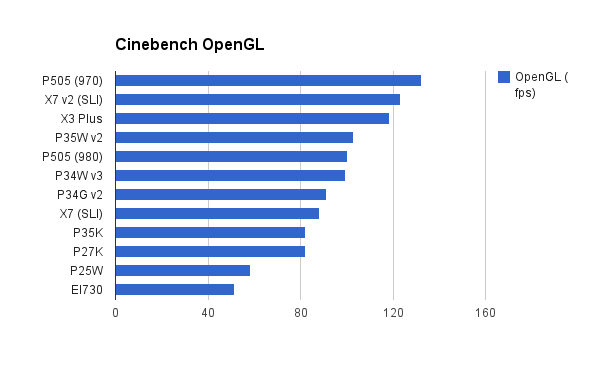 The P505 has varying results in the Cinebench test, with the more powerful processors of some of its peers giving it an edge. Still, its result remains within 10% of the highest CPU result. 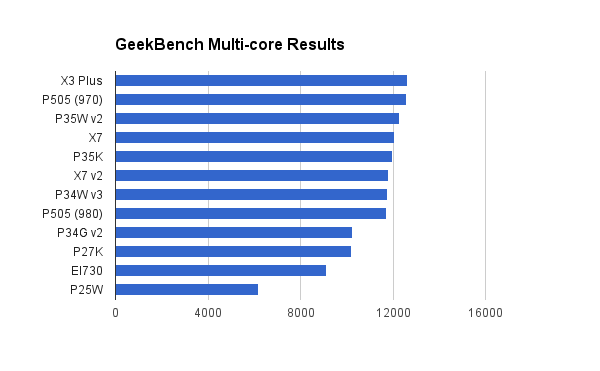 The P34W v3 again slips in a benchmark, a result of a slightly slower processor than most of the recent competitors. This intimates we can expect correspondingly worse performance than these laptops in CPU-bound games like Battlefield 4. Still, we remain within that 10% margin. CrystalDiskMark is a benchmark that examines disk read and write performance of the solid state drive within the P34W v3. 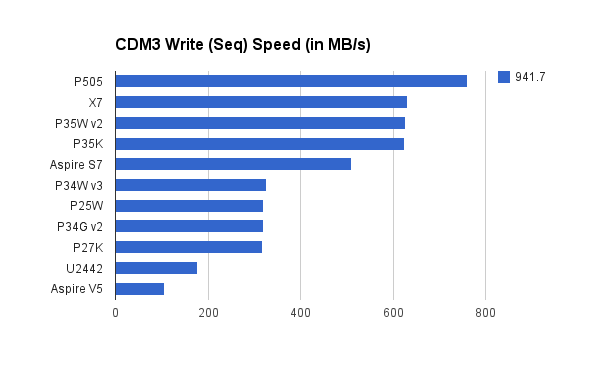 The Gigabyte P34W v3 has only a single SSD connected via SATA, so naturally we see worse results than dual or triple SSD configurations (and PCI-e cards). 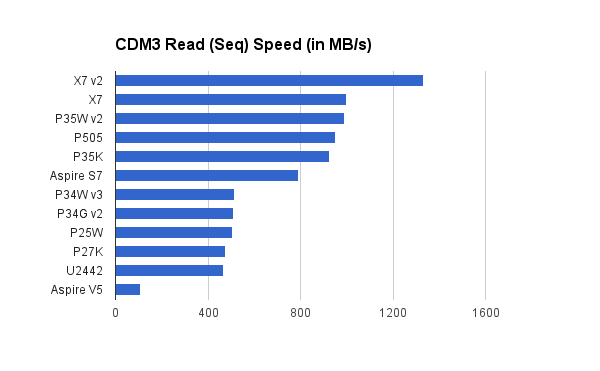 Still, we get better performance numbers than any other single drive, which shows the continuous progress SSD manufacturers have made over the past few years. 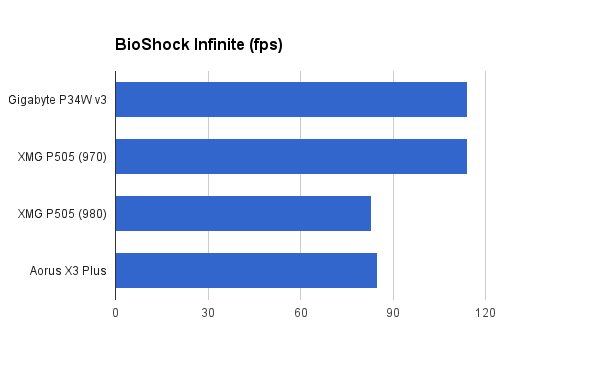 Bioshock Infinite is a relatively new addition to our range of benchmarks. I’m running it on the ‘high’ preset at 1080p resolution; the benchmark itself is run from the ‘binaries’ folder of the game’s files if you’d like to compare your current setup. The P34W v3 makes short of the Unreal Engine title, with an average of 114 fps at the ‘high’ setting. That’s the joint-highest result we’ve seen so far, and clearly demonstrates the laptop’s ability to tackle year-old games with ease. 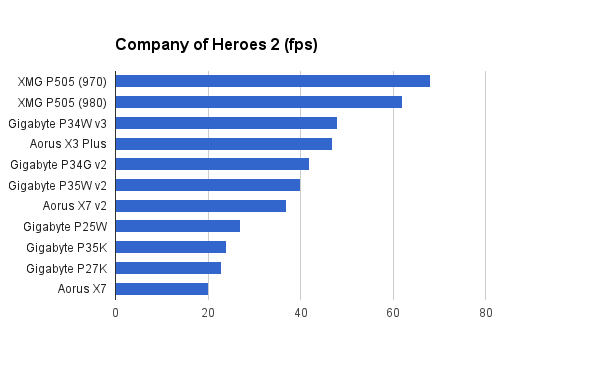 Our final benchmark is Company of Heroes 2, an excellent strategy game centred around the Eastern Front of WW2. The game includes a robust worst-case benchmark, so if the game is playable here then you’d expect much better results in actual singleplayer or multiplayer. A large update was recently released, but tests on my main gaming PC don’t seem to indicate any changes in benchmark performance. The test settings are 1080p resolution with no unit occlusion, v-sync or anti-aliasing, then medium for the other options. Here the P34W v3 does as well as expected, coming in ahead of all laptops with previous generation GPUs, but behind both configurations of the P505 (which have a better CPU and better GPU, respectively). It’s a strong result given how tough this benchmark is, and speaks to the Gigabyte P34W v3’s ability to handle current-gen games at high settings and the laptop’s native 1080p resolution. 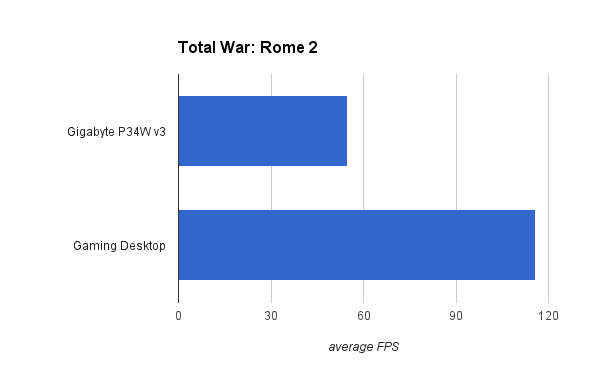 Total War: Rome 2 comes with a nice in-game benchmark, and offers a reasonable challenge to modern gaming laptops thanks to its large number of on-screen units and a good range of detail settings. We’re running on the Ultra preset at 1080p resolution. Rome 2 is a new addition to our benchmarking suite, so we only have one other result, from a desktop running a GTX 980 and a top-end i7 processor. That desktop scored 115.9 fps. In comparison, the Gigabyte P34W v3 scored a reasonable 54.7 fps. It’s again a promising sign for the laptop, although without real context for the moment. 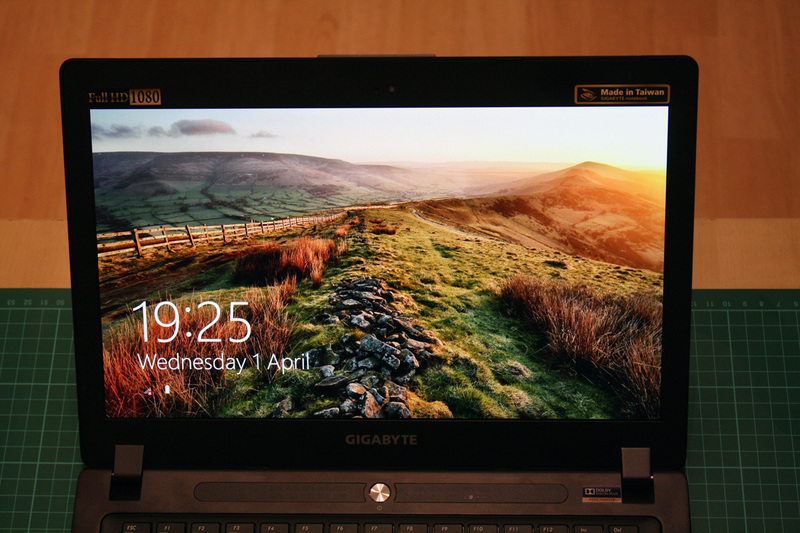 The Gigabyte P34W is a premium gaming laptop with performance to match. Its 21mm frame fits easily into the smallest messenger bags and won’t weigh you down, making it an ideal travel companion. Its five hours of battery life is reasonable for a gaming machine, although it’s only half that of the latest non-gaming laptops. You may find the P34W’s design a little lacklustre given its high price point; although it is slim, the overall design hasn’t changed in years and the P34W doesn’t stand out in a sea of black Windows laptops. Overall though, if you’re looking for both power and portability, the P34W v3 is one of the finest choices available. I have this Laptop with the GTX 965m 4Gb GPU, and 16GB RAM. It was because of this Laptop that prompted me to upgrade my Desktop HDD to an SSD. I have had this laptop open, and if you want access to SSD/HDD and the HSF. this thing is a joy. undo the screws on the bottom, lift the back cover off, and bang, it is all there waiting for you. A lot of time I would have to undo screws on the back, then lift the Keyboard, undo screws under there, than I can get to everything. My old laptop I had to also remove the motherboard just to get to the HDD. Yes, it will be harder to replace the battery, because it is built inside the system, but at least it isn’t of an iPhone difficulty (I damaged an iPhone 3G trying to replace the battery without adequate instructions). If I want to mod this system to include a water cooling loop. Well it looks like it could be a cinch to do.